Late Tuesday night a 1969 Porsche 911 sat innocently in its garage waiting for its next turn on the road. At the same time, on a nearby road, the driver of a white Pontiac Grand Prix was having trouble keeping their eyes open. In a cruel twist of fate, the driver of the Grand Prix apparently lost their battle to stay awake and fell asleep at the wheel. Drifting off the road, the driver crashed through three front yards before finally crashing into the garage housing the classic 911. 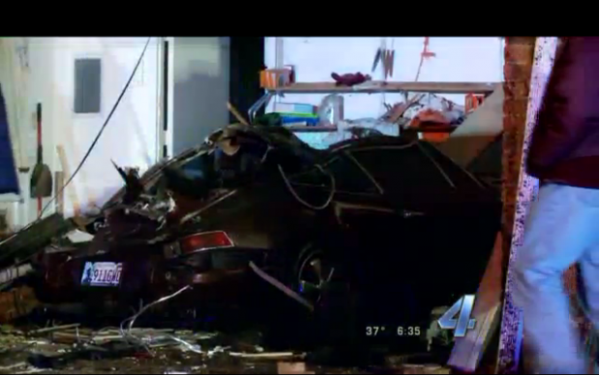 The report we read said both the garage and house were damaged, but it looking at the picture above it would appear that the Porsche got the worst of it. Our sympathies to the owner. The only good news is no one was hurt. Unfortunately, we haven't found a way to embed the video of the news report we saw so click here if you're interested in viewing it. If The Price Is Right, This Porsche 993 Should Sell! The least the news anchor could have done was pronounce Porsche correctly. I sent the news station an email…mentioning that the name has TWO syllables. Sad story. Hope the 911 owner had full replacement value coverage…and has a capable attorney.